The Nursery Fork gives contractors a tool to easily transport materials up to 3,000 pounds. John Deere announced on Dec. 17 that it has released and added a new piece of equipment to its line of Worksite Pro attachments. The Nursery Fork, also known as NF44, is designed to work with select John Deere E- and D-Series skid steers, compact track loaders and other competitive models. This attachment gives users the ability to easily transport and position up to 44-inch balled or container trees and shrubs along with rocks or light boulders. "Like all Worksite Pro attachments, our new Nursery Fork was designed to optimize performance and productivity," said Gregg Zupancic, product marketing manager for John Deere Construction & Forestry. "Whether you're moving plants, trees, boulders or boxes, the Nursery Fork is an ideal tool to help contractors move materials quickly and easily." The Nursery Fork has a 3,000-pound carrying capacity and a 54-inch fork opening. With one stationary arm and a second arm with swinging ability, operators can handle loads more efficiently. Additionally, the Nursery Fork has a 6-inch tread plate for gripping, and operators can opt for a pressure-control kit to limit arm-closing pressure. For the utmost convenience, the fork can be quickly added to John Deere skid steers and CTLs through the universal Quik-Tatch™ attachment system. The Nursery Fork is also backed by John Deere parts, service and warranty coverage. 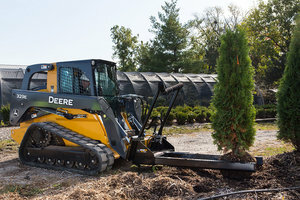 For more information, visit your local John Deere dealer or go to www.JohnDeere.com/Construction.